It's a true pity Laughton didn't direct more. This was really tense and stylish. He molded something of a dark fairy-tale - with wonderful cinematography and music - which really works, since it's about the children's experience. I've always thought Robert Mitchum was creepy, but he was sure something here. And Lillian Gish's contrast was enjoyable; their duet - one of my favorite parts - gave me chills. Southern Gothic meets noir with hints of expressionism. Mitchum is a powerhouse. Rev. Harry Powell: "Ah, little lad, you're staring at my fingers. Would you like me to tell you the little story of right-hand/left-hand? The story of good and evil?" My least favorite of Charles Laughton’s efforts from behind the camera. Mar 31, 2018 Faruk O. You won't find anything quite like this movie. It's got the darkness and light of a fairytale with a thread of the blackest humour running through it all, and let's not forget Robert Mitchum as one of the scariest villains in cinema. Fantastic! Cinematography ahead of its time, and extremely influential to this day. 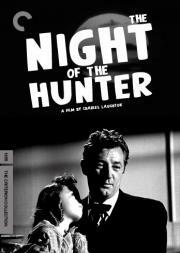 Creepy, fascinating, and downright bizarre, Charles Laughton's The Night of the Hunter is one of the finest films of the 1950s, and features an exceptionally strong performance from Robert Mitchum as the child-hunting Harry Powell.